Our school day runs between 8.30am and 4.15pm, though early years pupils may finish earlier if they wish. Lunch is served at 12:40pm and there are three play breaks within the school day- one in the morning, one before lunch and one during the afternoon. Fruit is available during morning break, and possibly a treat on Fridays! Home life can be busy, particularly the mornings and to try and help with this we offer a breakfast club. Drop your child off early with one of the boarding staff if you need to get to work and they will be looked after and join the boarding pupils for breakfast in the dining room. Fyling Hall is a small community and we view interaction with the Senior School as an important feature of the school day. On Mondays we join a whole school assembly led by the Headmaster, this integration means the transition to the Senior School holds no worries for our pupils. For the rest of the week morning assemblies at 8:40 are of a broadly Christian nature and an important daily gathering point for the Junior School. We believe it is never too early to teach traditional values such as honesty, courtesy and consideration. Exploring values, cultures and experiences plays an important role in our assemblies which are interactive with pupils and their contributions are encouraged. We aim to maximise the beautiful environment our school is located in. In the school woods we have a Forest School which gives pupils the chance to experience what they learn about in the classroom. 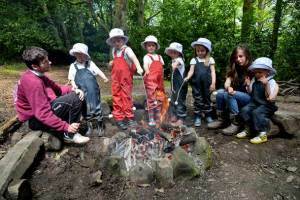 On Wednesdays the whole Junior School will put on their rain suits and go for an adventure at the Forest School. The activities are curriculum linked to Science, Geography, English and Art and this enchanting environment provides inspiration and excitement that enhances and reinforces learning. Not forgetting time to play and explore the environment! Learning to swim is an essential skill and every Thursday the whole school goes to have swimming lessons at the local swimming pool. Our experienced school staff cater for all abilities and pupils progress from learning to develop in to strong swimmers. Rather than come to school on Thursdays pupils can arrange with the Head of the Junior School to go straight to Whitby swimming pool for 9:30. On Tuesday afternoons Form 2 and 3 have drama lessons in our school theatre. During these lessons they prepare for the many productions and public speaking competitions they have throughout the school year. Reinforcing work from the school day is important. Form 2 and 3 have homework every evening which will vary in length but should not take any longer than 30 minutes. All pupils are encouraged to read at home every day as part of the whole school literacy policy. Combined with the Senior School we run a homework club after school at 4:30pm which is supervised by a teacher who is available to assist and support the pupils. 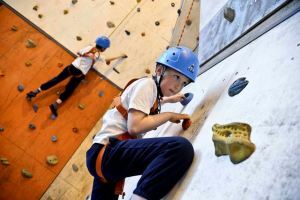 After school clubs are run every day of the week from 4:30pm until 5.30pm, with a wide range of activities available, from climbing to board games, choir to badminton. After school clubs combine senior students with junior ones, helping to build the familial relationships that the school prides itself upon.